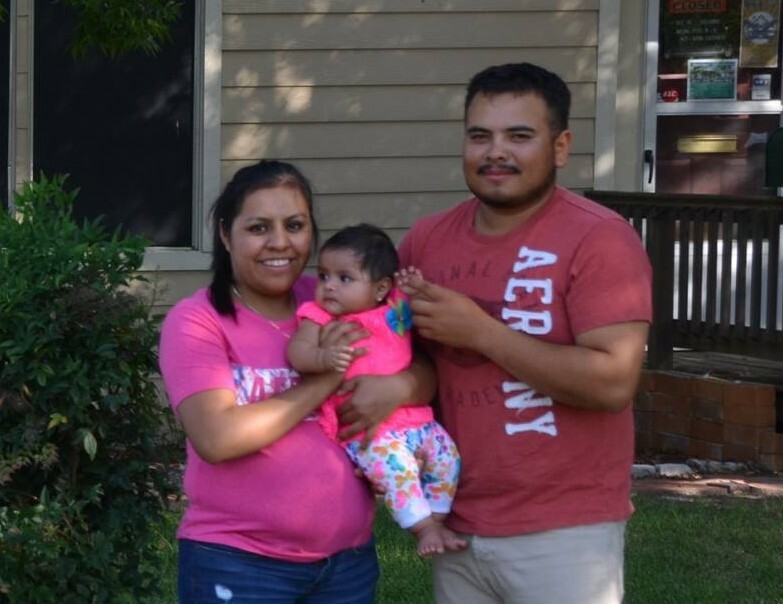 Juan and Maria are excited to purchase their home through Habitat for Humanity’s homebuyer program. Join our Corporate Challenge partners as we dedicate their home and express our hope that this home will bless this family and their future. Juan Almaras and Maria Navarro both grew up in poor towns in Mexico, towns so poor there weren’t any schools. Facing a bleak future, Juan and Maria joined their respective families in Texas in search of work and a better life. They both found work — and each other! They married in 2015 and welcomed a daughter in January 2016. Now they are expecting a second daughter in March 2017. With their family growing, the couple needs a space of their own. They currently live with with Juan’s parents and sister in a three-bedroom mobile home. Juan, Maria and their daughter all sleep in one of the bedrooms. Many families in Bryan and College Station must resort to overcrowded living conditions because their modest incomes can’t support the high cost of rent. Unfortunately, the couple can’t afford a conventional mortgage, but with B/CS Habitat’s homebuyer program, they will be able to start new lives in a new home that they can afford. It isn’t easy. Juan and Maria work full-time (he works days and she works nights) and take care of their daughter. And Maria was pregnant when they were accepted into the program in June 2016. Time was of the essence because they needed to put in 500 hours of sweat equity attending financial and home maintenance classes, building the homes of other Habitat homeowners and working at the ReStore before their new daughter arrived. With hard work and determination, they completed more than 500 hours! It’s a big relief getting those hours completed, but the couple is most relieved to know that their children will grow up in a community where they have schools and other opportunities that Juan and Maria didn’t have. They know their home can’t be built without generous donors and volunteers, and they are deeply grateful to all those who will offer them a hand up. That hand up gives them the opportunity to purchase a decent, affordable home that will bless the family for generations to come.